Introduction – Located near Mamandur, Kuranganilmuttam is a small village which is famous for a Shiva temple considered as the sixth among the thirty-two Tevaram Sthalam. As per a legend, Vali worshiped Shiva in form of kurangu (in form of monkey) at the entrance of the temple (west), Indra worshiped Shiva in form of anil (squirrel) from south and Yama worshiped Shiva in form of a muttam (crow) from north, hence the name Kuranganilmuttam. This story is depicted in various panels inside the temple. There are inscriptions of Krishna Deva of VIjayanagara dynasty as well in the temple. This temple is very famous from pilgrimage perspective. K R Srinivasan gives a reference from ‘Transactions of the Archaeological Society of South India (Madra) 1958-59’ where it is stated that the name of this village, Kuranganilmuttam, is perhaps a modification of the name Kurakkenimuttam where Kurakkeni would indicate a cell or vault situated below the ground and muttam the natural high ground or mound into which the has been sunk. This was later, perhaps, corrupted into Kuranganilmuttam which has led to the legend of monkey, squirrel and crow. This small village also has a very fine cave temple which is excavated in the rock sunk into the ground and may be assigned to the times of the Pallavas, preferably to Mahendravarman I. This article will talk about this cave temple in detail. Cave Temple – Located in middle of the village, this cave temple is excavated below the ground level. This characteristic perhaps make this cave temple unique among the group. It seems that the original rock was scooped out of the ground to make prepare a vertical scarp for the excavation. The front façade of this east facing cave is supported on two pillars and two pilasters. The pillars are carved in characteristic style of Mahendravarman having cubical blocks on top and bottom with octagonal shaft in between, while the pilasters are tetragonal throughout. The corbels above the pillars are in curved profile, however this curve is very sharp. There is another row of pillars and pilasters behind this front row, thus marking the ardha-mandapa and mukha-mandapa of the cave temple. This double bay arrangement of ardha-mandapa and mukha-mandapa is mostly seen in many of the cave temples of Mahendravarman. On the back wall of the cave are carved ten pilasters. These ten pilasters accommodate three cells and three pairs of dvarpalas. 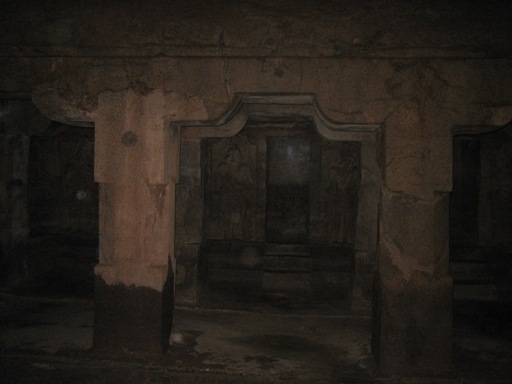 As there are three cells carved at the back wall, so it can be assumed that this cave temple was dedicated to Hindu Trinity of Brahma, Vishnu and Shiva. These cells are constructed above a platform which shows various elements of architecture as per shilpa texts. This platform is consisted to upana, jagati, tripatta-kumuda, kantha and kampa molding above it and below it. The central cell seems to be dedicated to Shiva as seen from the style of its dvarpalas. The southern dvarpala is standing half turned towards the shrine. His makuta, above jata-bhara, shows two prongs of trisula, one coming from his left side and one above the makuta. Northern dvarpala is standing facing front. His makuta is almost worn out. Both the dvarpalas are standing on support of their massive clubs which is entwined with a serpent. Both dvarpalas are shown wearing sarpa-yajnopavita with other various ornaments. There is a worn out image placed inside the cell. Whether this image could be of Shiva is not very certain. The southern shrine is composed of a cell and two dvarpalas on the entrance. Both the dvarpalas are similar in style and attitude as both are shown standing facing front in tribhanga posture. There one hand is resting on waist (katyavalambita mudra) and other hand is raised in kataka mudra, probably to hold a flower. The style of the dvarpala suggests that this cell was dedicated to Vishnu, if the cave was meant for Hindu Trinity. Inside the cell is placed a stone image of Vishnu, which seems to be a later addition. The northern shrine is also consisted to a cell and two dvarpalas at the entrance of the shrine. Both the dvarpalas are similar in style and posture, standing in tribhanga posture facing front. One hand is in katyavalambita mudra and another hand is raised in abhaya mudra. They are shown wearing jata-makuta and yajnopavita with other various ornaments. It seems that this shrine would have been dedicated to Brahma. The cell is empty now, however there is whole sunk in to support a stone/metal or wooden image of the deity. There are two cells excavated on the side walls of the mukha-mandapa. Both the cells are empty, however there is a whole sunk in to support images. There are two cell like structure on lateral walls of ardha-mandapa as well. Hence there are total of seven cells in this cave. To whom these four cells are for is not very clear. Dvarapalas of the shrine – There are three pairs of dvarpalas, which are discussed in detail above. We see a mix of dvarpalas here, one is shown turned towards the shrine, while other five are shown standing facing front. Inscription – There are few inscriptions found in this cave. One inscription will be detailed in the article, rest will be added once I have information about those. How to Reach – Kuranganilmuttam is located on Kanchi–Vandavasi road, located about 10 km. It is about 2 km from Dusi village. 2 km from here, you can reach to Mamandur, where four cave temples of Pallavas are excavated.